As the Cowboy Capital of the World, Bandera, Texas is quite the destination. You can take a step into the Old West by visiting dude ranches, expansive Hill Country parks, and cowboy saloons. 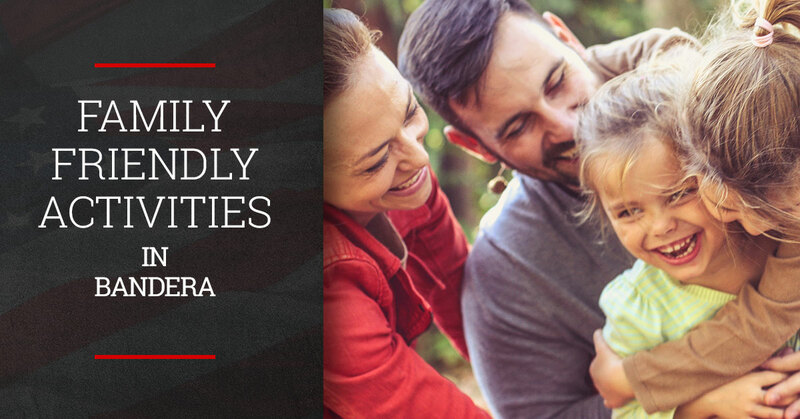 Even though Bandera is a trip to Wild West, there are still many tame activities to do with your family. Check out these family-friendly ideas for things to do while you’re in Bandera! You can’t visit the Cowboy Capital of the World without going to a rodeo. That would be like going to Paris and not seeing the Eiffel Tower, or traveling to Egypt and not seeing the Pyramids. It would be practically a crime! Every rodeo is not only kid friendly, but also incredibly entertaining for the entire family. The PRCA ProRodeo, one of the bigger Bandera spectacles, rides through town over Memorial Day weekend, but there are plenty of other rodeos during other times of the year. For an especially kid-friendly time, check out the Wild Hog Explosion in March, where children between the ages of 3 and 9 can compete in a piglet chase. When people think of Texas, they don’t always think of its incredible natural beauty. Hill Country, however, is absolutely stunning. You’ll want to plan a visit to any one of the numerous parks in Bandera, including the Lost Maples State Natural Area. This state park boasts more than 10 miles of trails, 21,000 acres of land, and organized camp sites. Hill Country State Natural Area is also a classic destination! Enjoy hiking, camping, fishing, swimming, and boating in Bandera, Medina Lake, Helotes, and Lakehills. If your kid is fascinated by dinosaurs . . . come to think of it, we don’t know many kids who aren’t fascinated by these prehistoric creatures. Take your family to the Bandera Natural History Museum to see more than 100 life-sized replicas of dinosaurs and other Ice Age creatures. The museum is interactive and features play areas, so kids are bound to stay entertained during the visit. For another museum option, the Frontier Times Museum is an excellent choice. This unique museum features exhibits all about Texas frontier life, including old rodeo memorabilia, cowboy gear, and much more! When you’re all tired out from a day on the lake or a trip down memory lane, there’s no better destination than The 4 Way Bar & Grill. Our bar and grill in Lakehills is family friendly and has a menu with options that even the pickiest of eaters will enjoy. We serve family-sized appetizers like loaded chili cheese fries, hush puppies, chicken tenders, and much more. For the main meal, we have delicious handheld sandwiches like grilled bacon and cheese, Big N’ Juicy burgers, and Texas-size favorites that the whole family can share. Stop by today for a family-friendly atmosphere and dining experience in Lakehills — right by Bandera, Helotes, Lake Medina, and San Antonio.